For more than six years, the Vicki and Kevin Davis Scholarship has covered the cost of college fees for concurrently enrolled Enid High School students in financial need. 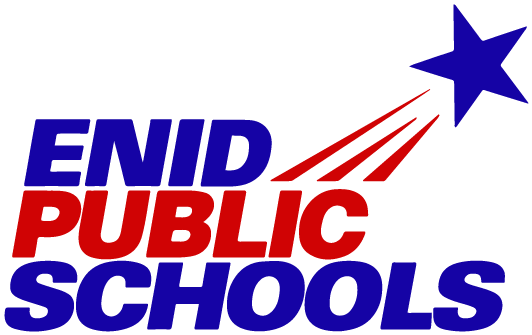 The Enid Public School Foundation announced today that the program is expanding, thanks to a $1,000,000 donation from the Ray Davis Family Trust. The Foundation has receive one-half of the funds, with another $500,000 earmarked for donation in 2023. 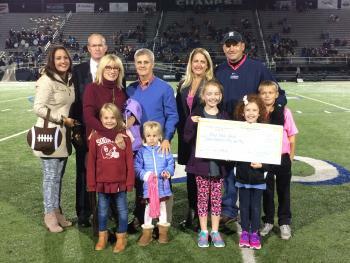 The funds, placed in a trust for the EPS Foundation, will be used to create scholarships annually for two seniors who have successfully participated in concurrent enrollment through the EHS University Center with assistance from the Vicki and Kevin Davis Scholarship program, which is dedicated to the memory of Ray Davis’ late children. Recipients must attend Oklahoma State University or Northern Oklahoma College. Seniors who plan to attend a career technology center also are encouraged to apply. Students will receive up to $20,000 annually if attending OSU, and up to $11,000 annually if attending NOC. All costs will be covered for those attending a career technology program. Vicki Davis graduated EHS in 1973, and Kevin Davis graduated in 1975.  Their grandfather, Perry C. Davis, established the P.C. Davis Construction Company, and together with his son, Ray Davis, built 18 school buildings for EPS, Phillips University, the career tech system, and other area school districts. In 2013, Ray Davis donated $314,000 to the EPS Foundation for students attending the EHS University Center – which was the largest single donation made to the foundation at the time. The funds have been used exclusively to pay fees for students with a financial need who wish to take concurrent classes. Since the original donation, 142 students have benefitted from the program, completing 1,165 college credit hours. Current Vicki and Kevin Davis Scholarship recipients are eligible for the newly created higher education scholarship. Scholarship applications from the Class of 2019 are due in the counselor’s office at Enid High School by March 15. For more information or a copy of the application, students should visit their school counselors. Information is also available by contacting Janna Jackson at 580-977-4592 or foundation@enidk12.org. We partner with individuals and businesses to continue to improve our public schools. Consider making a tax-deductible donation today. ONG, a division of ONE Gas Awards EPSF with a Robotics Grant! Martie Oyler, presents a check for $3,625 to Christine Smith, Enid Public Schools. Left to Right: Amanda Phillips, President, Board of Education, Randy Radar, Assistant Superintendent of Elementary, Janna Jackson, EPS Foundation Executive Director, Martie Oyler, Regional Manager, Oklahoma Natural Gas, Christine Smith, Director of Early Childhood, Lora Whitehead, EPS Foundation President, and Dr. Darrell Floyd, Superintendent. Mini Grants = Major Impact! Our Grants to Teachers Program makes a big impact on local classrooms. Over $24,000 was awarded in March! Thank you to all our Principal’s Pass Sponsors! EHS Principal Dudley Darrow wows the crowd game after game to chants of “Darrow, Darrow!” and demonstrates his football skills at Plainsmen home games all for a great cause! Thanks to Mr. Darrow’s arm and our sponsors, we have secured $5,750 in donations to schools throughout the district during the last few football seasons. Thank you Enid for supporting the Principal’s Pass! 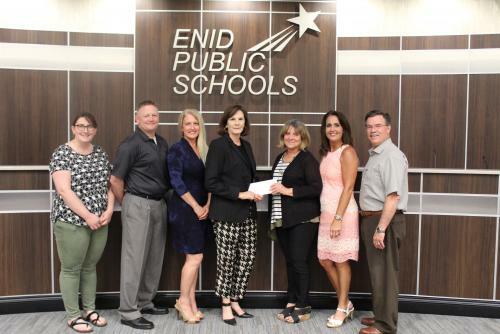 Enid Public School Foundation was created in the late 1980s to maximize the quality of Enid Public Schools by funding innovative classroom projects and materials. Since its inception the Foundation has grown according to the needs in the district. Our primary programs are Grants to Teachers, Teacher Scholarships, and the Vicki and Kevin Davis Scholarship Program for students who attend the University Center. 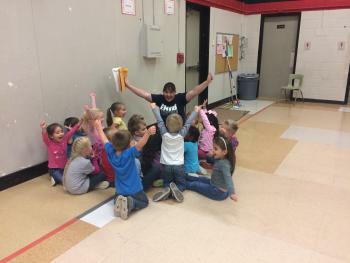 Since its inception, the organization and its donors have contributed over $534,000 to the school district in teacher grants alone. Initiative district and recently opened a University Center on the Enid High campus. The district’s youngest students benefit from devopmentally approriate full-day prekindergarten classes, including an intergenerational program. In addition to a dynamic academic program, the district has dozens of programs in the areas of athletics, visual arts, performing arts and music.